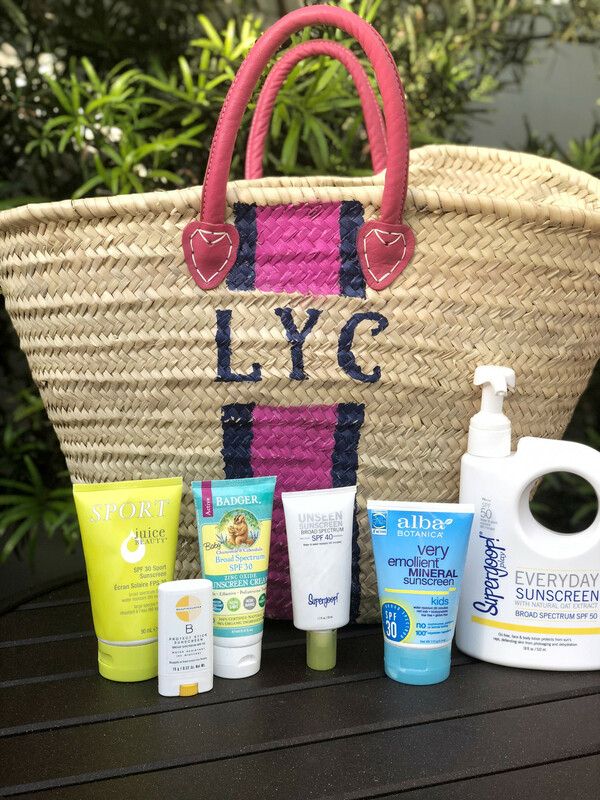 Since I get so many questions about our family’s favorite sunscreens I’ve put together an updated sunscreen review post for 2018! After trying a bunch on our recent trip I am sharing our favorites in every category! Chemical sunscreens, which contain chemicals, absorb the suns rays into the skin and reflect them as infrared rays. Many drug store sunscreens are chemical sunscreens. They can sometimes be irritating to sensitive skins but are generally very effective. Some contain parabens and the controversial ingredient oxybenzone (but the ones listed below don’t). Physical sunscreens, using zinc oxide, form a protective layer over the skin and reflect the sun’s rays. 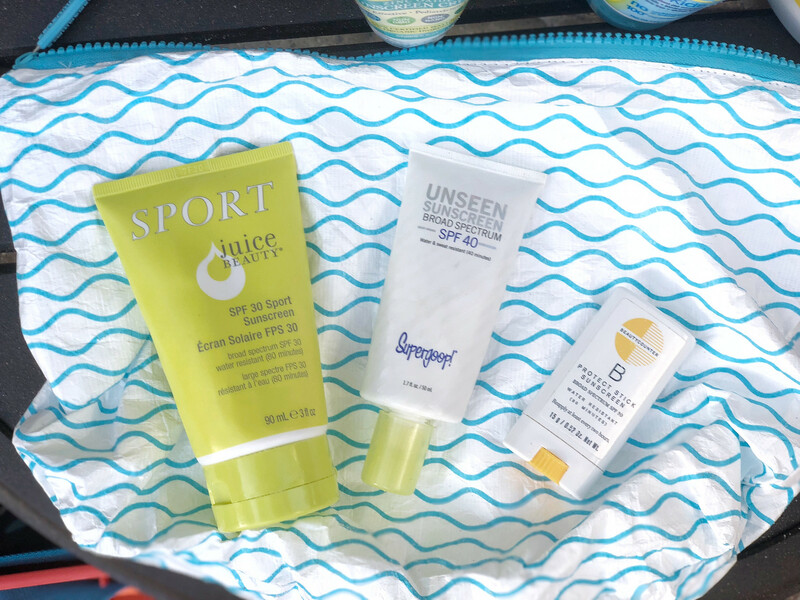 These sunscreens often go on thick and white (but I found some that don’t!). Physical sunscreens are what are considered “safe” or “nontoxic” sunscreens, although there isn’t any FDA regulation for those terms. 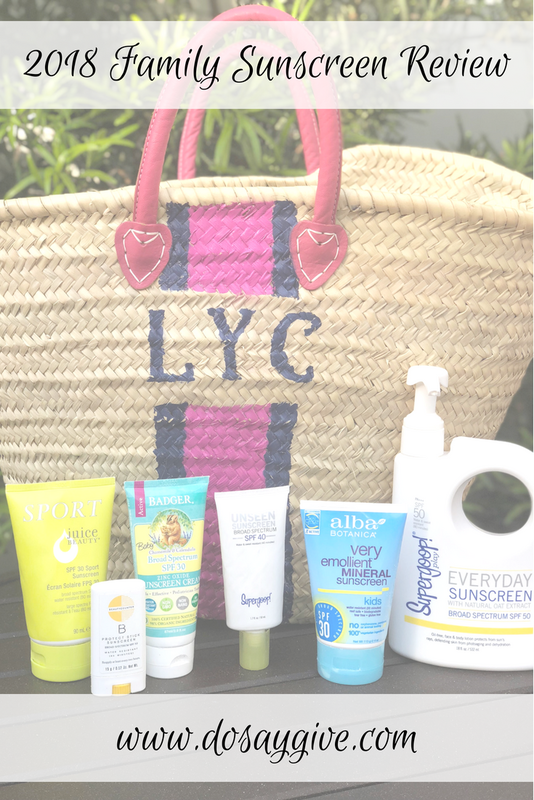 No matter what sunscreen you choose, you want to choose one that is Broad Spectrum, meaning it protects against UVB (cannot pass through windows) and UVA rays (causes pre-mature aging rays and can pass through windows). So what are my favorites? Keep reading! 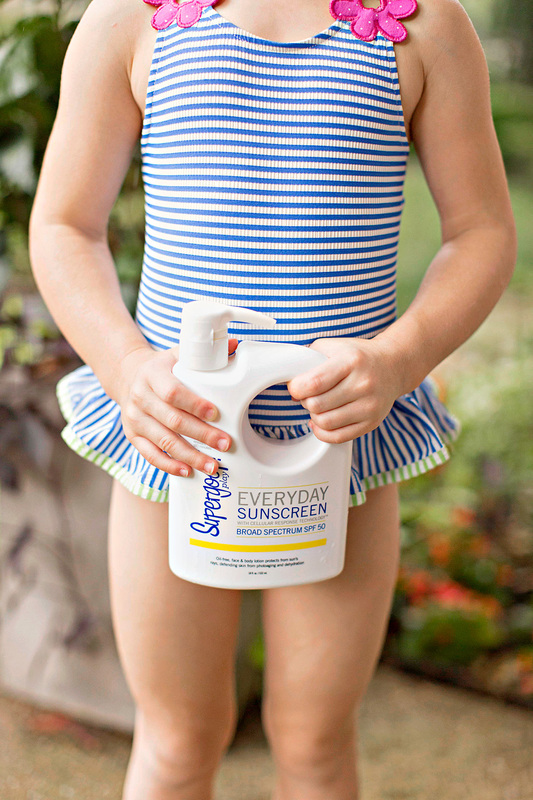 This Supergoop Everyday Sunscreen was my children’s overall favorite sunscreen at the beach. It doesn’t have a smell or leave a white residue, nor is it sticky. It’s also free of parabens and oxybenzone. I use it all over, even their face if I don’t have a face stick. This sunscreen lasts and is effective. Tip: my friends with boys keep this in their car during baseball season – the pump is so easy and mess-free. 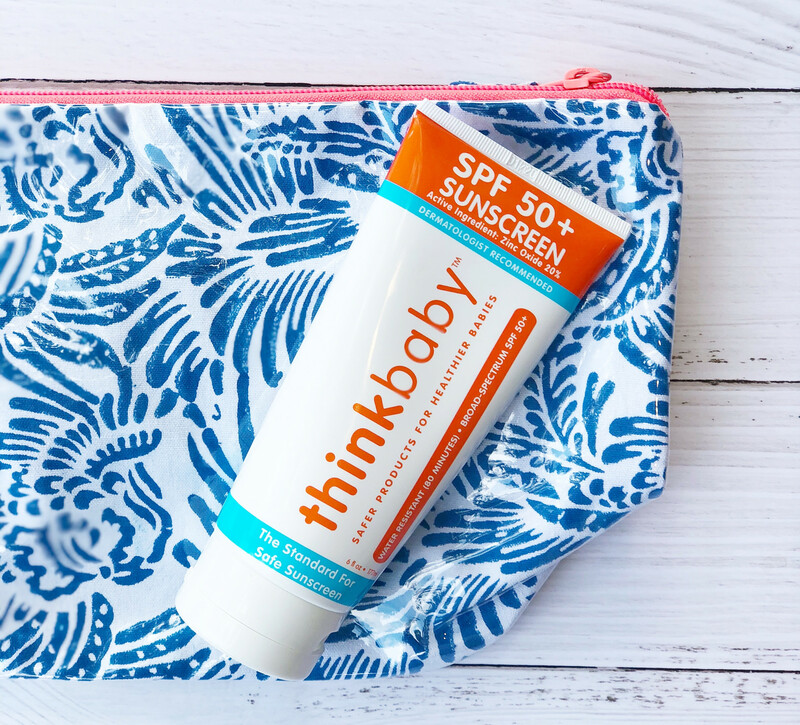 Of all the physical sunscreens we’ve tried Thinkbaby is our current overall favorite, especially for the price on Amazon. If you follow the EWG ratings, it has a 1 rating. It doesn’t leave a white residue which is a huge plus in my oldest daughter’s book! It is broad spectrum and SPF 50. I like the citrus scent. This is technically a baby sunscreen but anyone can use. It is reasonably priced, too!! Runner up: Juice Beauty’s Sunscreen is another great physical/mineral sunscreen and is not too pricey. It has a little bit of a fruity smell but I like it. I also like how the Beautycounter sunscreen goes on the skin but it is pricey considering we go through a lot of sunscreen. Didn’t Love: I used Alba Baby and Badger on our baby girl but the white residue stays for a long time. It made me feel a little better knowing she was protected but my older girls do not like that kind of residue! My girls prefer a sunscreen stick on their face for less mess. Beautycounter’s stick has been a favorite for years. It does not go on white. Note: they’ve recently added a new mineral stick – let me know if you’ve tried it! Supergoop’s new Unseen Sunscreen (which they can’t keep in stock!) glides on clear and is the perfect primer before makeup. It is a chemical broadband sunscreen but does not contain parabens or oxybenzone. This would be great to keep in your tennis bag or golf bag! Runner up: Elta MD Broad Spectrum is a dermatologist favorite (physical) sunscreen. The clear formula is great for acne prone skin.They also have tinted versions that are nice for summer days! Also Tried: Obagi has a new facial sunscreen that’s tinted. Doesn’t smell and goes on easily, almost like a foundation! 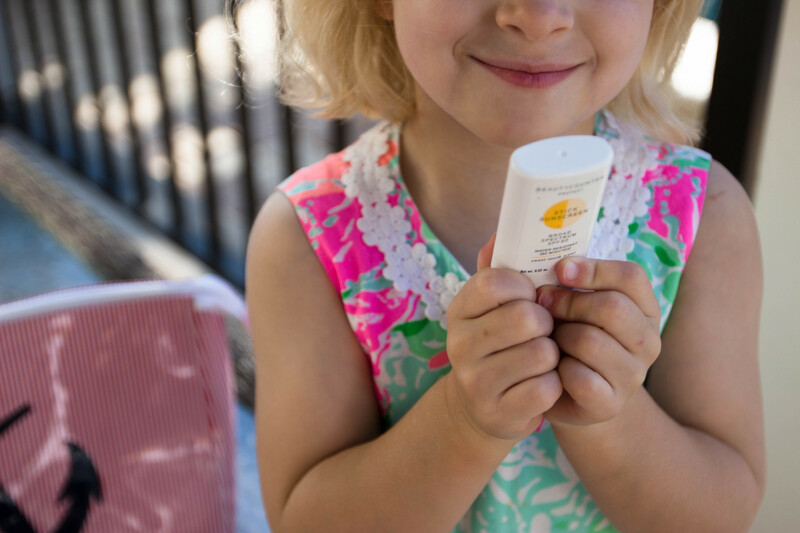 Favorite Sunscreen for Sensory Sensitive People! I shared this mousse sunscreen last year. It’s pricey but children with sensory issues usually like it! 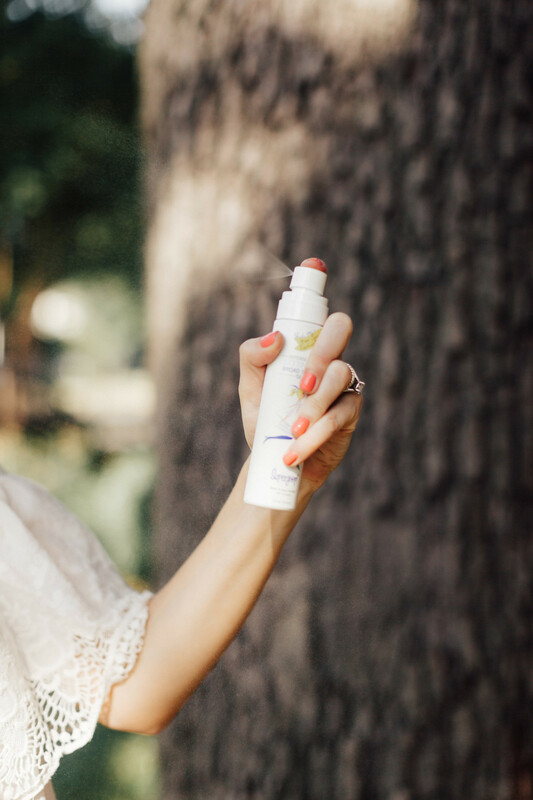 This little spritzer sunscreen is the perfect and refreshing way to reapply sunscreen when you’re on the go or just need a little protection here or there. And it makes a great gift for a friend’s birthday or end of the year teacher gift. (They have a mini size, too, that would be cute for a gift basket.) Add a cutesy little tag that says, “Thanks for making my year so sunny!”. Was this post helpful? 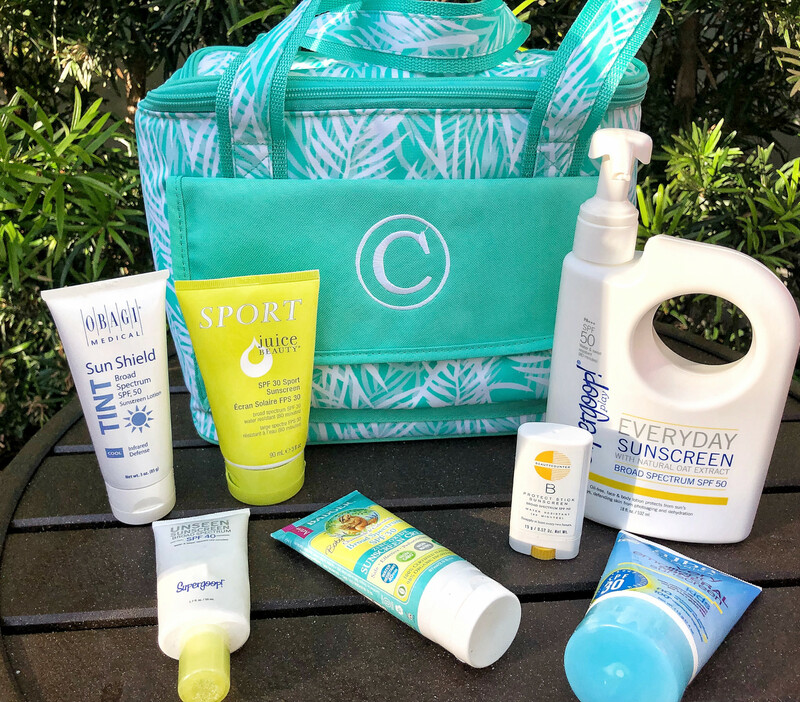 Share below and tell me your favorite family sunscreens! Also, check Instastories later on because I am going to show y’all how each of these in action! 3 Lower Photos: Beckley & Co.
Tote: My sister handpainted but similar here! Will you please post something about sunscreen that does not cause yellowing on swimsuits or towels? I’ve heard of many of these but glad to know which ones you love! I bought think baby at target the other day before reading this so glad to know I made a good choice! 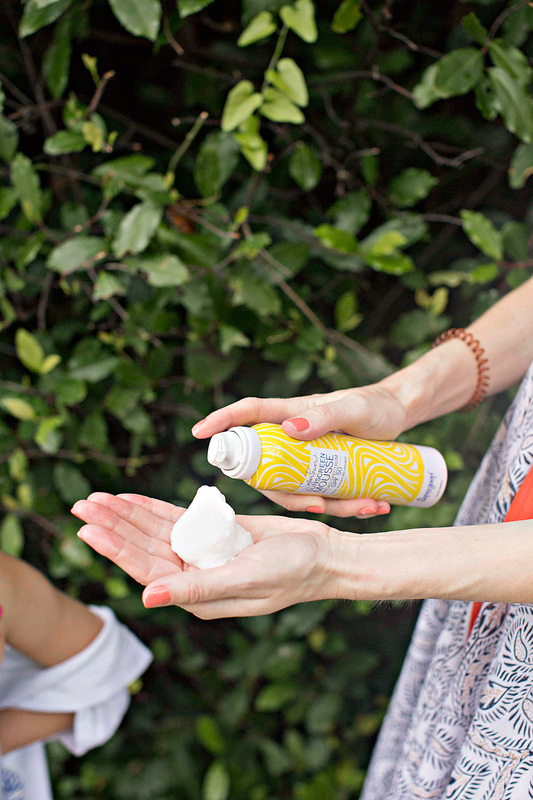 Would you say that Super Goop is not a “clean” sunscreen? The term “Clean” isn’t really regulated. But clean beauty followers would probably say no, it isn’t because it has Octinoxate, which in some studies show an effect on hormones. Although the studies weren’t conclusive and some question the methods of these studies (i.e. the ingredient was fed to rats instead of applied as sunscreen from what I understand). Note: this particular supergoop formula doesn’t contain oxybenzone though which is a big no, no in clean beauty circles. For these reasons, I am okay with this formula even though it might not qualify as completely clean. 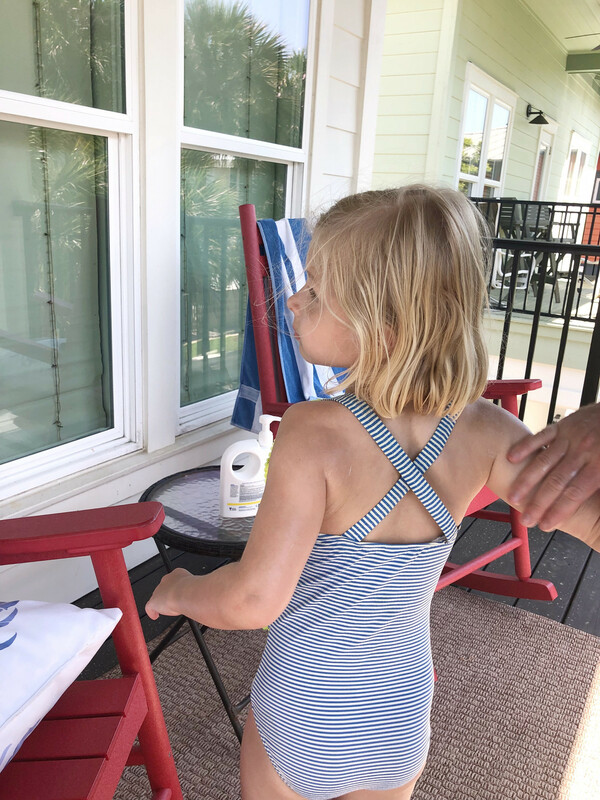 I tend toward the physical/clean sunscreens but my girls and husband REALLY like the feel of this one and that it doesn’t leave a residue.